This easy Quinoa Crusted Chicken with Goat Cheese is quick, healthy and gluten free! A perfect meal for busy weeknights that both kids and adults will love! Putting the TV on mute and then making up your own narrative. Not that I am currently sitting at my computer, with the TV on mute, narrating to myself while I type. I just thought you might need a good date night idea sometime, or something. Don’t say I don’t look out for you. Also, I will allow you to judge my lame, 27-year-old self for thinking that watching a mute TV is an acceptable date night. How the Huberoni puts up with me, I don’t know. I think it’s the food. Scratch that. I KNOW it’s the food. You know what else is fun, and also a lot less lame? Eating your side dish and your main dish TOGETHER. Liiiiike, at. The. Same. Time. Mind blown? That’s what I thought. Ever since those Potato Poppers where I failed miserably at using quinoa as a breading, I have been determined to make some sort of crusted quinoa chicken recipe work. Which we WON when we ate that jalapeno popper chicken with quinoa crust! Who would have thought that quinoa breaded chicken would actually be SO SO DELICIOUS. I mean, between you and me, I pretty much thought that quinoa hit its ceiling at something more “traditional” like a quinoa chickpea avocado salad. JOKES ON ME because quinoa’s ceiling? 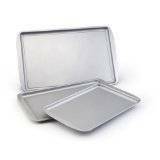 It is made of GLASS and it CRUSHES it when hugged around a juicy piece of chicken in a magical combo of side dish meets main dish AT ONCE. True life fact: If anything can make a chicken breast recipe a winner, it’s goat cheese. I mean, have you tried makes goat cheese stuffed chicken breasts? Or really, have you just tried goat cheese in general? It can even make a goat cheese CHEESECAKE. Mr. FFF was watching me create this recipe and he said that he thought that even HE could make it. I mean, he would burn Cheerios if that was somehow a possibility. LOVE YOU BABE. Anyway. Back to easy, yummy quinoa crusted chicken. 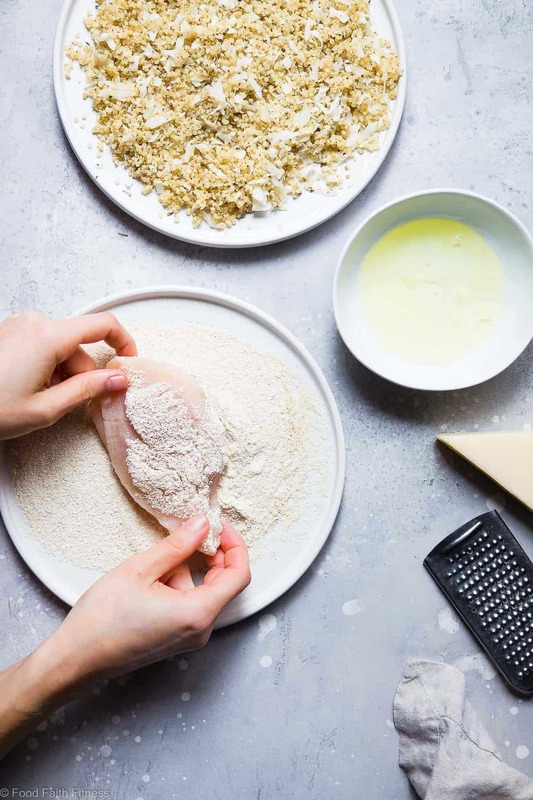 Besides being super stinking easy your Cheerio-burning husband could make it, it also feels EQUALLY fancy in the sense that you’re pulling out your MARTHA STEWART chops and making your own BREADED CHICKEN. I mean, she probably doesn’t eat breaded chicken. Probably only super-fancy duck or something, but you get it. If you wanted to make it feel a little more “kid friendly,” I bet you could slice the chicken into quinoa crusted chicken strips too. <– Told you. Glass ceiling. The sky is TRULY the limit. 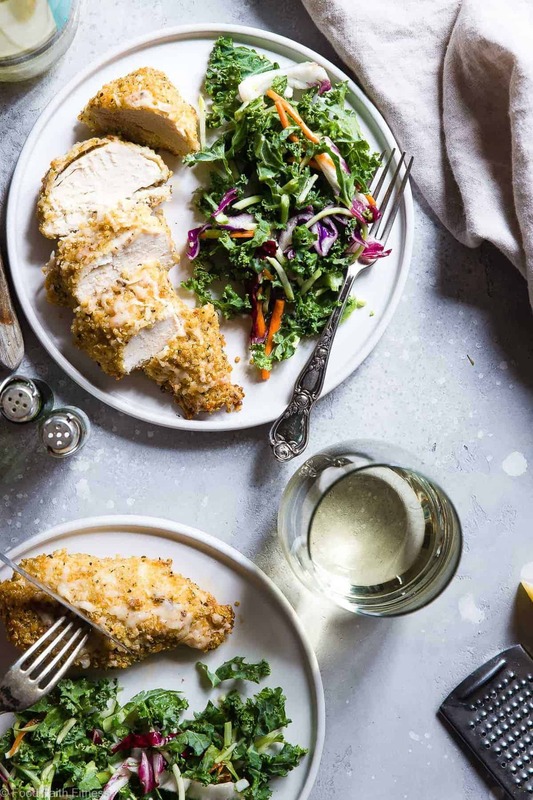 As if you needed more reasons to make this quinoa crusted chicken for dinner TONIGHT – guess what – you probably even have all the ingredients…because there ain’t very many. Bring 1/2 cup of water to a boil and stir in 1/4 cup of the uncooked quinoa. Cover, turn the heat to low and cook until all the water is absorbed (about 15-20 minutes.) Set aside to let the quinoa cool. Place the remaining 1/4 cup of uncooked quinoa into a spice grinder (or a magic bullet! )** and process until ground into a fine flour. Pour the quinoa flour into a large, shallow plate. Transfer the cooled, cooked quinoa into a large bowl and add in 1/4 cup of the grated Goat Cheese, the Italian seasoning, garlic powder, and season to taste with salt and pepper. Mix well and pour into a large, shallow plate. Pour the egg white into a large shallow plate. Dredge each breast into the quinoa flour, pressing to get it evenly coated. Then, transfer each breast into the egg white, also making sure to evenly coat it. Finally, transfer the breasts into the cooked quinoa/cheese mixture, really making sure to coat each side. You will really have to press the quinoa in to make it stick. You will probably have leftover quinoa flour and cooked quinoa! Place the breasts onto the prepared baking sheet and lightly spray with cooking spray. Bake until lightly golden brown and crispy, about 20-25 minutes. Turn your oven to high broil, sprinkle the remaining 1/4 cup of grated cheese on the chicken and broil until melted, only about 2 minutes. *Extra-aged goat cheese is hard like a cheddar cheese, it is not creamy and crumbly like the goat cheese you may be familiar with. The creamy, crumbly, traditional goat cheese will not work in this recipe! **you need a VERY small blending device for this, or the quinoa will not grind. This looks fantastic! I am a BIG fan of goats cheese – it is seriously tasty. Me too! You would love this then Lauren! Thanks! Not sure if I should admit this or not, but my husband and I have been known to put the TV on a spanish station (since we both don’t speak it) and make up words for what they’re saying! Pretty funny when doing that with soap operas! 🙂 This chicken looks amazing, Taylor! I love your use of quinoa and extra-aged goat cheese. 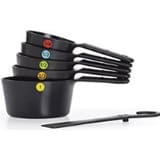 Looks so easy to whip up! Pinned! HAHA! Oh my gosh, I need to try that next Gayle – too funny! Soap operas would be SO good! Love the quinoa with the chicken. Have a great day Taylor! HAHA! I am so happy that you used eleventy billion Melanie! Quinoa as breading!? I’m so excited to try this out! My husband is going to love me for this one I’m sure 🙂 plus there’s the goat cheese! YUM! My husband loved this! It’s a fun, new twist on quinoa as a side dish! we are huge chicken lovers and I’m always looking for new recipes. This looks like a winner! gorgeous photos too Taylor! Huge fan of using quinoa in dishes! I would love to try using it to crust chicken or any other meat – just looks fabulous! And goat cheese on top? Win-win!! Isn’t quinoa so great and versatile?! Thanks so much Julie – goat cheese makes everything better! Oh, chicken nuggets would be so good – I gotta try that! Thanks for the love and pin girl! I am ALL over that healthy plate up there. Girly, that is some amazing looking chicken! ohhhhh giiiiiiirl! This is such a beautiful meal! I’m all about the crispety crusty chicken, and did someone say “aged goat cheese?” Please and thank you! This is why we need to meat. I love of crispety crusty chicken and old goat cheese! Taylor, I’m loving this. I bet it’s super crunchy and yum. I must try. Totally crunchy and yum! Thank you Norma! Thank you so much Beth! If you like quinoa, you will love this girl! Yay! I hope that you LURVE it Michelle! Thanks! Goat Cheese… enough said. I’m in! I knew there was a reason I loved you 😉 Thanks lady! 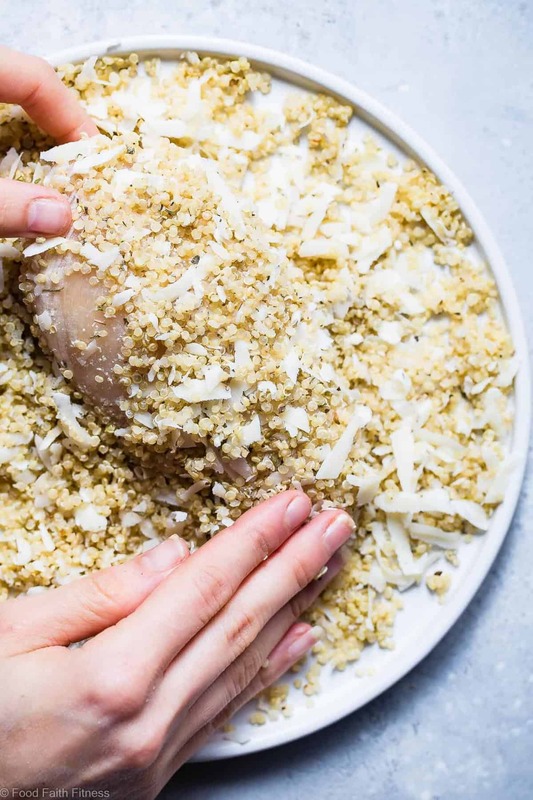 I love the idea of using quinoa in this recipe to crust the chicken! I must try this out! Thanks so much Julia! It’s a nice change! Yay, new ways to eat quinoa!! This looks super yummy (and simple – double yay!)! Right?! Sometimes it gets a little boring! Thanks Girlfriend! This looks great! I love that you added in a little goat cheese too….yum! OH YUM! Then it would be all creamy inside – DO IT! I had no idea that you could crust chicken with quinoa! Such a great idea Taylor! I didn’t either until it worked! Ha! Coating chicken in quinoa is clearly a brilliant idea. An idea that I’m going to execute in the kitchen soon. Your photos are stunning. Pinned. OMG! 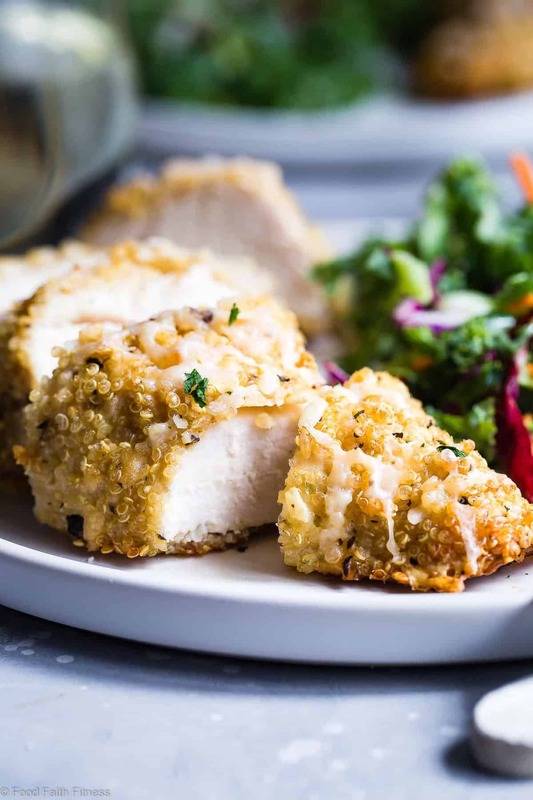 Goat cheese anything sounds yummy, but quinoa crusted chicken, WOW, yes yes yes! Definitely pinning this, and I’m going to tell my husband that he needs to make it for me…and that we need to have a date night where we create our own narrative to the TV lol…I just see wins with this recipe (and I’m obsessed with Sartori Cheese)! Oh, and the photos are STUNNING! LOOOOVE! Isn’t Sartori the GREATEST?! So many awesome flavours! P.S. 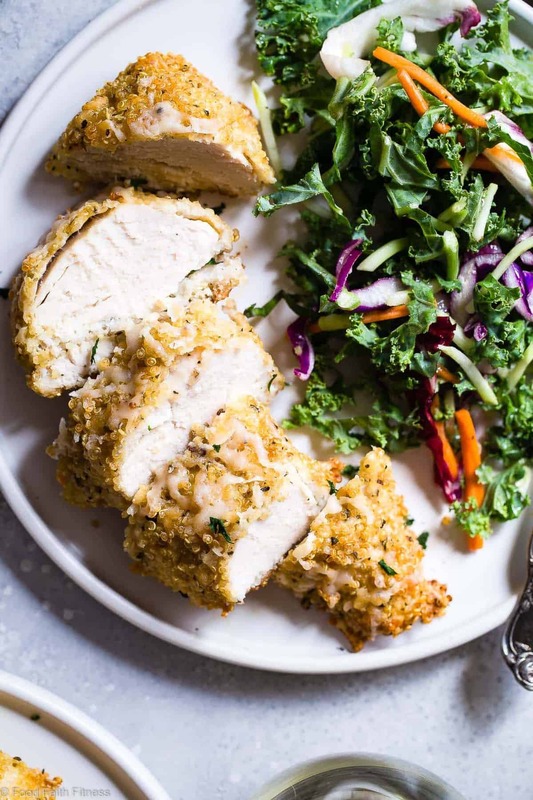 Quinoa crusted chicken – OH MEEOMY!! I haven’t stopped drooling since I saw this on FB last night! Haha! Well maybe you should re-create the scenario with your daughter? 😉 It’s totally fun and not weird I promise! You are da sweetest (as always!) You would totally lurve this..and I THINK goat cheese is lactose free? So you could eats it! YAY! You got it! Thanks for hosting! It would be helpful if the recipe noted that you need to have a TINY food processor in order to do this. Not a normal size one. Ugh. I don’t have access to a food processor at all, but that is not going to keep me from trying this recipe tonight. Thanks to my daughter Nikki for sending me this link. Haha! Thanks Emma, I try to keep it interesting. Please let me know if you like it! Side note: I used a small, 3 cup food processor to grind the quinoa. A huge one won’t work! I see you are all people big lovers of goat cheese. I love that recipe and I intend to cook chicken coated quinoa tonight, but the problem is that I can’t stand goat cheese, it tastes like the smell of goat sweat. What cheese could be a substitute without overpowering the other tastes involved? Once again, thank you so much! I postponed our dinner till tonight. I used Parmesan Cheese and it was just wonderful. The whole recipe so healthy and nutritious. It’s perfectly fit to our fiber diet. My husband was just as happy as I am. I’ve never tried quinoa before but I’ve been wanting too & this recipe may be the perfect way to try. I love the plate presentation, yum! 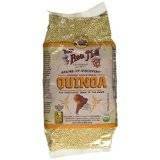 Oh quinoa is so good, you must try it! Thank you Leslie, please let me know if you do try it! 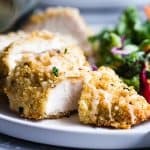 What a great way to add a “breading” to chicken while still being healthy! Thanks Pascale! Please let me know how you like it! I made this as a quick lunch after work. It was an absolute hit! My husband loved it!! and I did too. Definitely a keeper! Woo hoo! I am so pumped you loved it as much as we did! Thanks Mariam! This was SO yummy! Thanks for the recipe! I had all the ingredients – surprisingly!! I could not get my food processor to make the flour and ended up having to substitute Wundra – which worked! I’ll master the quinoa flour next time – plan to do a bit of research on what I’m doing wrong. ???? But, either way, I am SO pumped you liked it!! Thanks for letting me know!! Loved this recipe, but when I pulled the chicken off the pan all of the quinoa crust on the bottom came right off. I had a feeling that might happen so I was very generous with oiling the pan. I really pressed the quinoa on the chicken as well so I’m not sure what else I can do… Any tips for keeping it all together? Do you think there is anyway to make this recipe work without egg? Thanks! I really don’t sorry! The egg is super necessary to get the quinoa to stick! OHMYWORD!! i cant wait to try this!! I LOVE LOVE goat cheese ( like in you pomegranate and cheese stuffed chicken). It’ll be a hit for sure!! This looks ridiculously tasty! Not to mention the many healthy aspects of it!! Gonna have to make this soon! You would love it Katie! let me know if you try! When is dinner because I want to fill my belly with this deliciousness?!!! I bet they would LOVE it like this Jennifer! Such a great idea to use quinoa as a coating!! And goat cheese…delish! This would be a fabulous date night in recipe! Right?! So good for that! Thanks! I’m glad you got the quinoa coating figured out as this chicken is amazing! I have quinoa flour that I plan to try instead of grinding the quinoa. Will see how that works!